Are you trying to make up your mind whether or not to get a Palm Pre Plus. Well at up to $560, it's a lot of money when your not exactly sure if it's the smartphone you really want. Though there are a lot of other competitive smartphones, the Palm Pre Plus can still hold its own. Taking a close-up look at the Palm pre Plus, not only will you notice its uniqueness but also the smooth and sleek design. Bundled with a lot of options, large touch screen and a slide out QWERTY keyboard, it still is a viable option when compared to others. This phone can be used in pretty much any situation or environment. It can be used for personal use and also for work. With a 3.1-inch, vibrant 24-bit color, 320x480 resolution HVGA multitouch display, you can browse the Internet effectively and watch HQ videos. I has a 3-megapixel camera with LED flash, has geotagging and video capture. It also comes with accelerometer, ambient light, and proximity sensors. If you need to type, the QWERTY keyboard is a little bigger on this phone and will definitely help you from having too many typos. It can be quite frustrating when you have to type the same key more than once. Your contact list and favorite apps are easily updated without much help from your own part. This phone could turn out to be addictive. If you are one of those people who like to multi-task, then you should probably have this phone. This is more or less a mini-computer. You can check email's, support for Microsoft Exchange with Microsoft Direct Push Technology, POP3/IMAP (Yahoo! Mail, Gmail, AOL, Hotmail, etc. ), schedule things, prioritize your list all at the same time. Most things you would normally do on your home computer, can definitely be done on this phone. You will also get real time notification, so that you are not lagging behind on anything. One of the things I love about this smartphone is that you can have all your social network sites, email’s, task, appointment all synchronized and presented to you under a single page. If you are crazy about apps, you will have access to thousands of them. 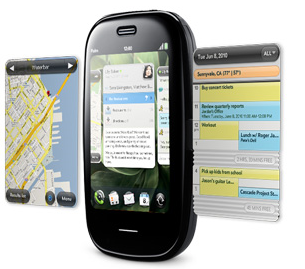 Apps from social networking sites, news, games, stocks, weather and so much more are available on the Palm Pre Plus.